I’ve been an Argos fan since I was born. I’m old enough to remember watching games at the old Exhibition Stadium on the CNE grounds, and of course the Skydome era. I’m the first to admit that the Skydome wasn’t a great place to watch football. There were some seats where you got a good view of the game but others that were definitely not as good. I’ve heard purists say that there are no good indoor football stadiums. Those people have obviously never visited Ford Field in Detroit. Ford Field was built for football. Yes it also hosts concerts and other events but its primary reason for existence is football. I’ve sat in the cheapest seats available and still had a great view of the field. So it can be done, but wasn’t done at Skydome (and no, I won’t call it Rogers Centre). Interestingly, my Dad had seasons tickets with a large group of people at Exhibition Stadium, but when the team moved to Skydome for the 1989 season, the great tickets he’d had at Exhibition Stadium turned into obstructed by players seats because of the shallow slant of the seats and the habit football players have of spreading out along the sideline. They were also decidedly worse seats for more money – the tickets at Exhibition Stadium were on the 45 yard line, south (open) side, about 1/3 of the way up. These new ones were on the 25 yard line and only a couple of rows up. (For the following seasons there would be tarps over those seats because you couldn’t watch the game from them). 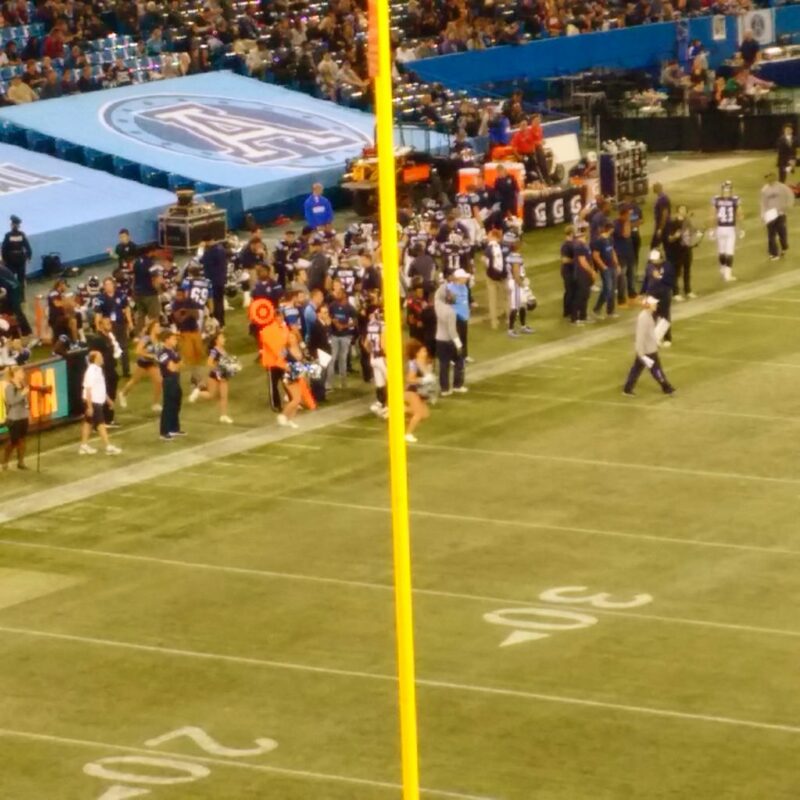 He and other members of his section spent the better part of the season arguing with the team about the seats and eventually most of them just gave up their tickets, my dad included – his entire row gave them up at the same time and nobody at the Argos ever apologized or tried to get the fans back. I managed to convince him to take me to at least a game a season after that, but he was never as into football as I was after that. I would have surpassed him eventually in my love of football, but it happened more quickly than expected because he felt that he (and all of the others in our section) got a raw deal. That said, that was a very different era for the CFL and goodness knows how many owners ago for the Argos. 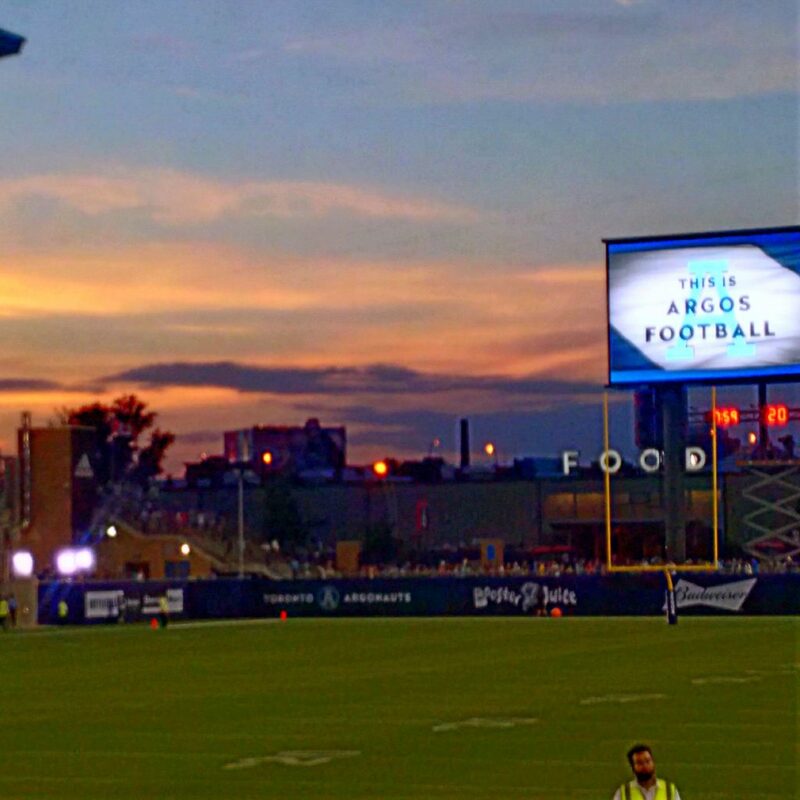 When moving to BMO field was first brought up, I first worried that other season ticketholders would be in the same predicament we were in in 1989, but then realized that the new Argos staff with their focus on customer service and fan enjoyment wouldn’t let that happen again; so then I started thinking about outside football. 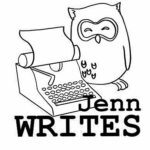 A little background: I’ve been a member of Argonotes (the official band of the Toronto Argonauts) for my entire adult life – joining while I was still in high school and continuing through University and Grad School and beyond. I mostly play piccolo though I’ve been increasingly pressed into service with the percussion section. Woodwind instruments aren’t a great mix with rain or snow and heat can throw them out of tune too so I was a little concerned with the proposed move. Also I’m a wuss and have a complexion that I can only describe as Irish meets Vampire. I don’t tan well, I burn easily, and I wear UPF 50+ clothing and sunscreen year round. So sitting in the sun watching the game could go anywhere from “this is the coolest thing ever” to “I’m going to spontaneously combust”. I was hoping for the former, but got the latter at the first game. So I upped my sunscreen game and the next game went much better. BMO Field has some spectacular sunset views. Almost bursting into flames aside, I LOVE outdoor football. BMO field is a truly enjoyable place to watch a game, I haven’t managed to find a bad seat yet (though I am intrigued by the blue squishy seats), and there’s actual tailgating again! There was tailgating in Toronto once upon a time when there were parking lots near the Dome instead of the crop of condos that went up over the past decade, but those went the way of the dodo as the condo boom happened. Now, tailgating is back in Toronto. Most games have two separate tailgate locations – one in the Ontario Place Parking lot and one at the Shipyard that is close to the Princes’ Gates in front of the newly built (or still under construction) Hotel X. The one over at Ontario Place is restricted access but the Shipyard is open for all the fans when it’s running (which unfortunately it isn’t during the CNE games). Both locations have food for sale, and cheap beer ($4 for an ice cold Ontario craft beer!) and in the Ontario Place location there are plenty of families with portable grills and people throwing around a football. Oh and you’ll see Argonotes at both tailgates (weather and energy permitting). Look at those Blue Seats – they look like they’re for a ride! The atmosphere inside the game is different too- there’s a lot of energy, and a lot of noise – and not just from the band. My only complaint with the gameday experience is that the piped in music over the loudspeaker is unreasonably loud – to the point that you can’t carry on a conversation with the person sitting next to you over it. When the PA announcer asks the fans to get loud, the endzone (where the band sits) responds – they stomp on the metal risers and hit the back of the seat in front of them and generally make as much noise as possible. It’s a lively experience, and one that I’ve experienced in other CFL cities but felt was missing in Toronto. Do they need to get more bodies in the seats? Yes, for sure, but that’s not something that’s going to happen immediately, especially with the Argos having such a tough time winning on home turf. This season was complicated by an awkward schedule – hopefully the last of its kind, necessitated by the renovations at BMO field taking longer than planned and pushing the primary tenant (TFC) out for the first part of their season which has meant that there are some weird gamedays still (though I quite enjoyed the CFL’s version of Monday Night Football) which should be resolved next season. 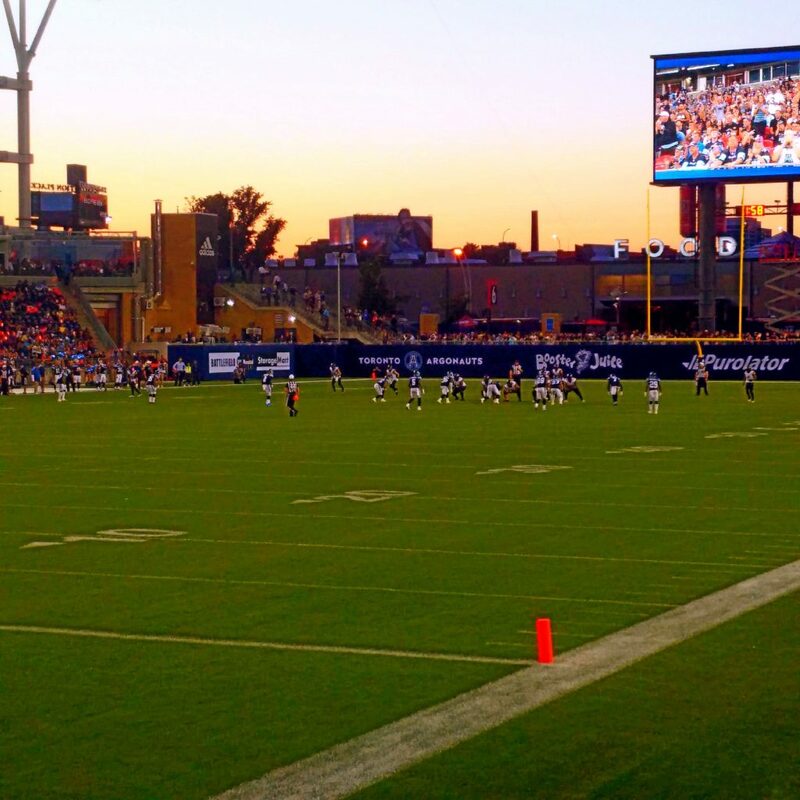 There are a few home games left this season to impress the hometown fans, and I hope the Argos take full advantage of them and that Torontonians come out and experience a game before dismissing the CFL as an entertainment option. Because that’s what it is – an affordable entertainment option. The ticket prices, unlike those of most of the other professional teams in the city allow for a family to go to a game without spending the equivalent of a car payment on tickets. 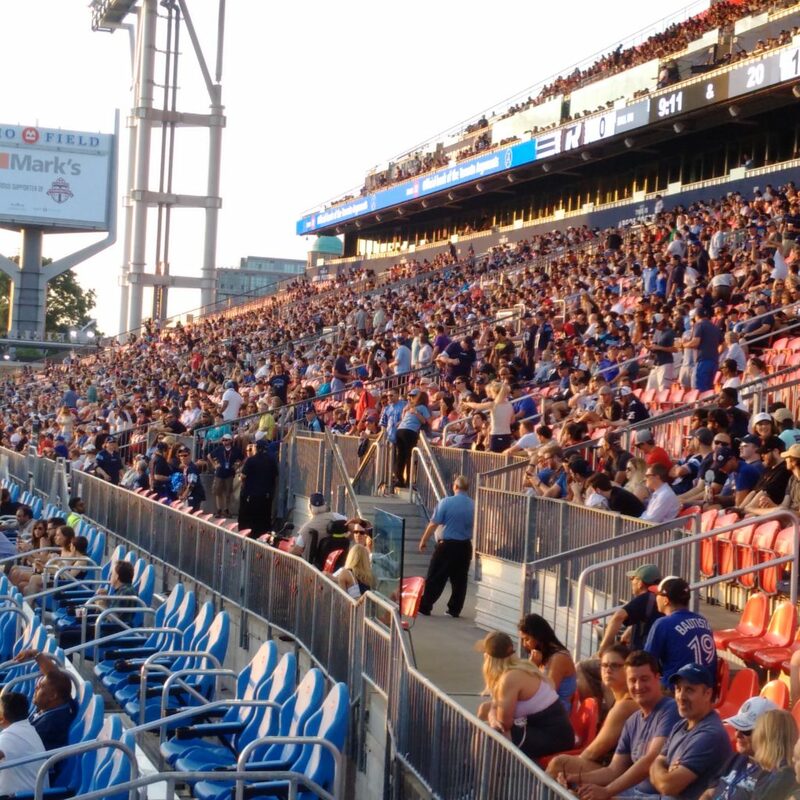 Make no mistake, there ARE CFL fans in Toronto – there are enough of them to mostly fill BMO field most games. So long as the on-field product is worth going to see. The only team in this city that gets fans out consistently while not being competitive plays at the other MLSE-owned building in town. Interesting. I’ve been to one game at BMO stadium so far and enjoyed it. The midfield section I was in, way up high, had relatively few people although the online seating grid showed most of them as not for sale. Company seats not used? Seats held back but not issued? I spent the 4th quarter in the end zone section. More fun. Especially watching the people in the first row in the corner who have the worst view of the field but the best view of the cheerleaders and who often are shown on TV (especially after an Argo TD. BTW I have seen the Argos now in four home stadiums since I attended a game when they played at Varsity Stadium.